i want calculations for w x h x d ( 100 x 25 x 1.5 ) mm thick copper busbar. I want to learn how current capacity is decide based on cross section or dimensions or vise versa. please explain in detail. thanking of you. Do I have to subscribe to every download or technical article I need? Can u pl explain hot to calculate current rating of bus bar. and pls share the formula. Please provide an example… unable to understand that how to use..?? there’s no unit for power on the spread sheet. is it in kva or kw? thanks! 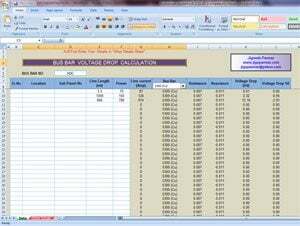 I ask you what is the bus bar calculation formula? 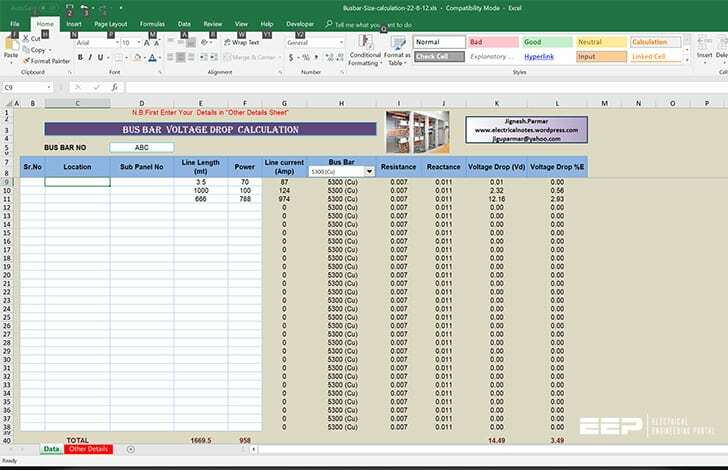 In case of Busbar voltage drop calculation you take Resistance=0.005 ohm and reactance=0.011 ohm . what is the reference of these values. have any international code ? also how can i get a cable resistance and reactance ? Very useful..Thank you very much..
thanks.but i don’t understand the way to calculation. please help? please advise and calculate, i have 5x1250Amps,.8pf, 220v gensets, synch to a common busbar, and two outgoing CB’s of 2500A, what will be the main busbar rating. Customer normally shouldn’t ask you this, but to tell you the ratings of loads, so you can calculate the CBs in incomers and outgoing cubicles, as well as rating of main horizonal busbars. When you have all these information, you can calculate short curcuit withstand current on busbars. What is the size of the bus bar ? but unfortunately I couldn’t download the excel calculation files! what should I do? Pl. tell me How/D.G set automatically start when mains supply fails.